A monstrous black hole’s rude table manners include blowing huge bubbles of hot gas into space. At least, that’s the gustatory practice followed by the supermassive black hole residing in the hub of the nearby galaxy NGC 4438. 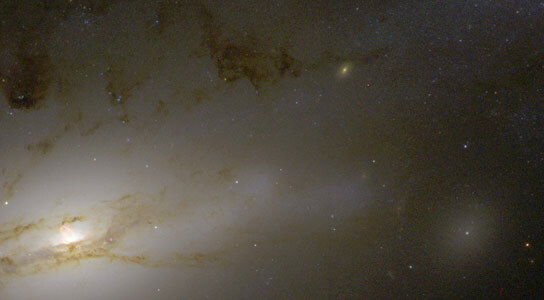 Known as a peculiar galaxy because of its unusual shape, NGC 4438 is in the Virgo Cluster, 50 million light-years from Earth. These extremely hot bubbles are caused by the black hole’s voracious eating habits. The eating machine is engorging itself with a banquet of material swirling around it in an accretion disk (the white region below the bright bubble). Some of this material is spewed from the disk in opposite directions. Acting like high-powered garden hoses, these twin jets of matter sweep out material in their paths. The jets eventually slam into a wall of dense, slow-moving gas, which is traveling at less than 223,000 mph (360,000 kph). The collision produces the glowing material. The bubbles will continue to expand and will eventually dissipate. Astronomers use quasars in a technique known as Delta-Differential One-Way Ranging to help achieve precise navigation of spacecraft in deep-space. It’s necessary to pinpoint a spacecraft 100 million kilometers from Earth to within 1 km. To achieve this level of accuracy, ESA experts use ‘quasars’ – the most luminous objects known in the Universe – as beacons in a technique known as Delta-Differential One-Way Ranging, or delta-DOR. Quasars are fascinating objects that can emit 1000 times the energy of our entire Milky Way galaxy. This prodigious luminosity originates from a region only about the size of our Solar System. They are fueled by supermassive black holes – which might be billions of times as massive as our Sun – feeding on matter at the center of their host galaxies. Using the results of the delta-DOR processing together with the range and Doppler measurements, which are also derived from the spacecraft signals received on ground, ESA can achieve an accuracy in spacecraft location of just several hundred meters at a distance of 100,000,000 km. 2 Comments on "Astronomers Use Quasars to Help Navigate Spacecraft"
Keep posting the cool stuff 🙂 Thanks! That’s got to be the next best thing after the sextant and gps.